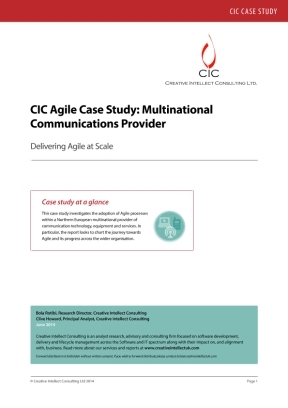 This case study investigates the adoption of Agile processes within a Northern European multinational provider of communication technology, equipment, and services. In particular, the report looks to chart the journey toward Agile and its progress across the wider organization. Read on to learn how Agile has driven organizational and operational challenges and fostered an environment that has allowed the business to flourish in a highly competitive market, and to consider the positive impact that this could have on your organization.